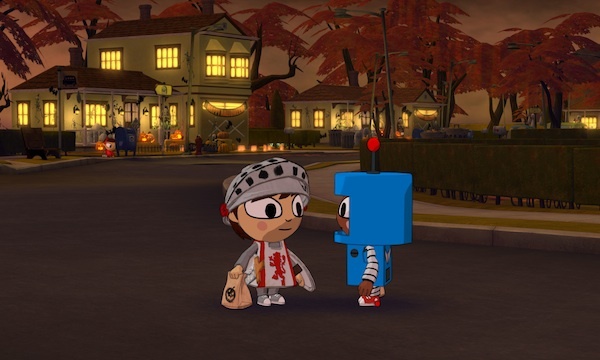 One of my favorite Halloween-themed RPGs of last year, Costume Quest, has just been released for PC and you can find it right here on Steam. It’s worth noting that this is the first PC release from Tim Schafer’s Double Fine Productions in six years. When I played Costume Quest last year, I was immediately won over by its cartoonish style, its charming wit, and its highly-approachable gameplay. It’s also the only game I’ve ever played that had an Arrested Development reference in it. I’ve never really been a fan of turn-based combat in games, but I found myself surprisingly satisfied by Costume Quest’s simple, straight-forward battles. However, if you’re a long-time RPG player, you may find the game’s mechanics a little too thin for your tastes. Having said that, some may find the $14.99 asking price a little steep, considering it was released a year ago on Xbox Live Arcade and Playstation Network for that same amount. This PC version does include the Grubbins on Ice DLC, which adds a bit of extra value to the package. I’m sure it’ll inevitably have its price slashed as part of a future Steam sale, but due to the game’s Halloween theme, there’s no better time than now to play it. What do you think? Is it reasonable to ask full price for a year-old game, even if it’s the first time it’s been made available on a particular platform or should games be offered at a discounted price in these types of situations? If you’ve played Costume Quest, what did you think of it? Drop us a line in the comments and let us know what you think! Update: I completely forgot to mention that Playstation Plus members can get Costume Quest for free until midday on 10/18 as part of their subscription.